Two Australian theatre practitioners, a Japanese teacher and a Chinese Human Resources Manager walk into a bar. No joke. A few hours later I walk out with a Chinese name. 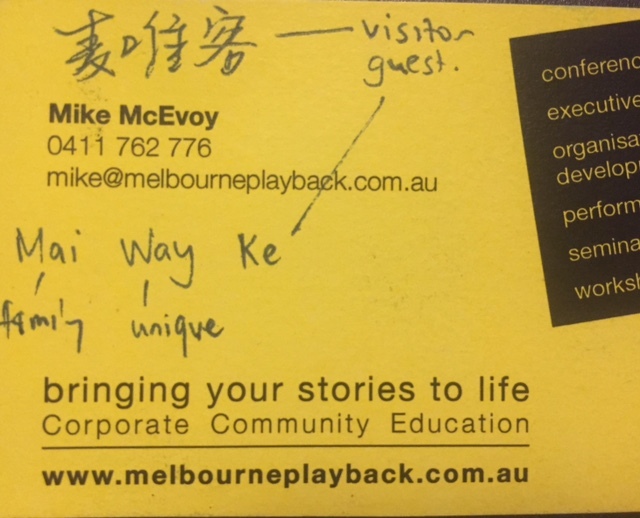 My new name translates roughly as ‘Unique Visitor’. I’m a guest speaker at TEFO’s Drama Theatre and Education Conference in Hong Kong and it’s the second night of the conference. Tonight, we four merry travellers have participated in a workshop led by Sean Shun-pui Kwan. In it he shared one of the many ways he incorporates theatre exercises into his corporate workshops. The conference has been full of great keynotes, panels and workshops like this one and we’re inspired to continue the conversation over a beer. On the first day I joined Mr Kwan, Jonathan Neelands and Yong-wen Peng to speak in a plenary session on corporate learning and development. In my presentation I spoke about Melbourne Playback Theatre’s work supporting organisational culture programs with our performances and training. I made grand statements like; ‘Theatre is a change agent and community builder’, ‘Storytelling helps people understand and shape organisational culture’ and ‘Playback theatre is transformative’. Like most of the applied theatre practitioners, teachers, social workers and corporate facilitators at the conference, I’m interested in the pro-social benefits of theatre. This is our shared interest and despite the diversity of practical application, diverse cultures and varied experience, it connects us. Just as theatre helps connect the people we work with. Jokes that start with three characters of different nationalities walking into bars strike me as culturally insensitive and inappropriate. Sometimes they are downright racist. They are a form of storytelling that people use to make sense of cultural differences. But because they use stereotype and make fun of those differences I think they often serve to divide us. At the bar tonight, we spend a lot of time sharing stories and learning about our cultural differences. We grew up with different families in different countries at different times. But each of us has a personal story that make us unique. And through hearing each other’s stories we also discover similarities. Qian’s English name is Michelle. In her first English lesson the teacher offered her a choice of two names, Michelle or Stephanie, after characters from an American TV show. ‘Was that Full House? !’ ‘Yes!’ A bad 80’s sitcom we both loved as kids isn’t the only similarity we find tonight, but it’s a funny one! In my presentation at the conference I cited this Harvard Business Review article and its list of mechanisms that business leaders can use to shape organisational culture. Our playback theatre performances and the theatre-infused experiential workshops that we deliver contribute to most of the informal mechanisms listed. These techniques build connections between people, just as the workshops at the TEFO conference bridged massive language and cultural barriers to build relationships. But there’s also a lot to be said for ad hoc social gatherings like this drink at the pub. Mike McEvoy delivered his presentation ‘Theatre Leading Organisational Change’ at the TEFO Conference in Hong Kong on 1st May 2015.